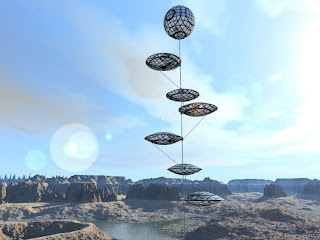 Joseph Cory, the environmental architect visionary of Geotectura, with Technion aerospace engineer Dr. Pini Gurfil, developed helium-filled platforms constructed from a fabric coated with photovoltaic cells. Called Sunhope, the idea is to deploy solar energy-harvesting systems with a low environmental footprint. The balloons are made to last about a year without no maintenance. Cory and Gurfil estimate that one or two balloons could power a home. The balloons are easy to deliver and set up. Cory and Gurfil have made prototypes and conducted research. They found that a 10 foot balloon delivers about a kilowatt of electricity (equivalent to 25 square meters of solar panels). Target cost is about $4,000 per balloon, less than half the price of a typical ground-based grid. This YouTube is Hebrew television coverage, but has Cory speaking English, and shows how the balloon's are constructed. 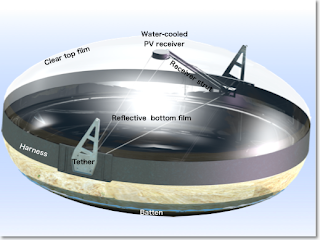 The idea is a nice innovation over Cool Earth Solar's balloons --theirs are ground based. Each 8-foot-diameter balloon is made of plastic (like that used to bag potato chips), with a transparent upper hemisphere and a reflective lower hemisphere. When inflated, the balloon's geometry concentrates inbound sunlight onto a photovoltaic cell at the focal point. This transparent upper surface protects the cell from the environment, including rain, insects and dirt. A single cell placed in this balloon generates about 300 to 400 times the electricity of a cell without such a concentrator. The balloon is strong enough to support a person's weight, and is tested to withstand winds of up to 125 miles per hour. what if someone shoots it. you ever think of that!!! !